- Includes a LEGO® NINJAGO Kai minifigure. 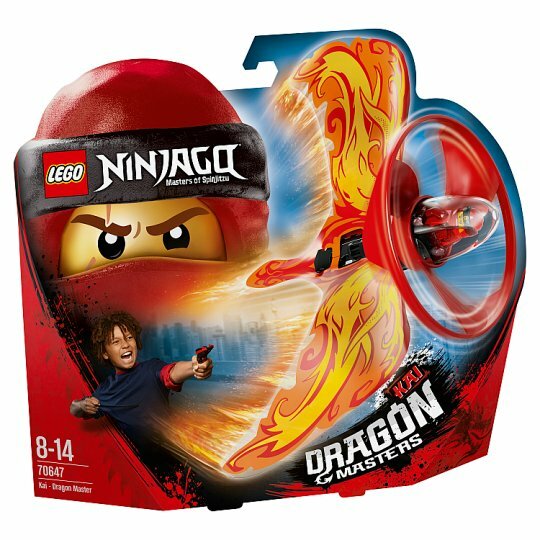 - Features a buildable LEGO® brick handle, minifigure capsule, blade element, foil dragon wings, rip cord, and a 2x2 round LEGO tile with Kai logo. - Perform The Dragon Strike, The Dragon Flip, The Dragon Nest, The Eye of The Dragon, The Nosediving Dragon and other masterful moves. - Compete against your friends in The Dragon Duel, Dragon Darts, The Flight of the Dragon, The Dragon Switch and The Dragon Hunter. - Use your environment to create your own fantastic flyer challenges. - Add 70644 Golden Dragon Master, 70645 Cole - Dragon Master, 70646 Jay - Dragon Master and 70648 Zane - Dragon Master for even more aerial ninja action. - Flyer (without rip cord) measures over 7” (19cm) high, 8” (22cm) wide and 6” (17cm) deep.